Updates to Guy A's profile since your last visit are highlighted in yellow. We have eight children, seven boys and one daughter and 22 grandchildren and two on the way. Our More…three youngest children live close so we get to see and play with 11 grandchildren that range in age from 37 weeks old to 12 years old. This keeps us very busy. What a blessing. I just spent 4 weeks in Juneau, Alaska during part of January and February. I got to watch a new grandson (Braden Walter) that was only 7 weeks old while his mother returned to work. It was fun to spend time with our son Tom, Trisha and their new baby. This is their first child. I retired from the Post Office July 27, 2012 with 30 years of service. Elizabeth and I went on a month long vacation to celebrate my retirement and to visit our children and family who live out of State. We went to Michigan, Minnesota, North Dakota, South Dakota, Colorado, and spent two weeks in Juneau, Alaska with our son Tom and his wife Trisha. I'm a member of the Iowa Valley Bicycle Club in Marshalltown. 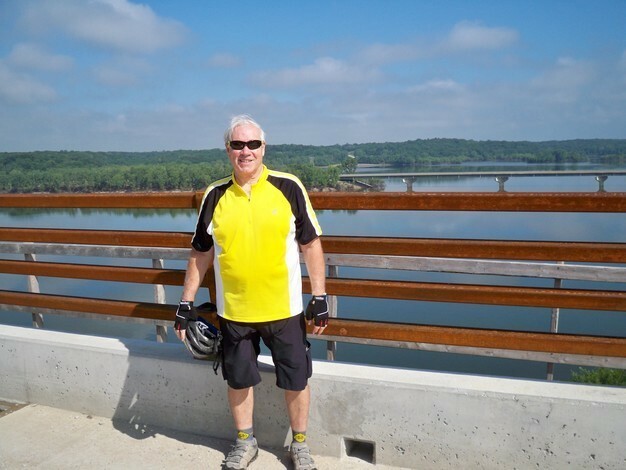 Love to ride the High Trestle Trail and the Raccoon River Valley Trail in Iowa. I have been able to ride on 8 RAGBRAI's and 3 BRANS (Bike Ride Across Nebraska). 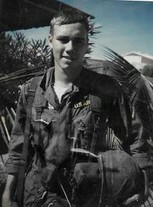 In the fall of 1964 after enlisting in the Army I went to Fort Leonard Wood, Missouri for Basic Training. I enlisted at the Post Office in Ames, where I used to work. After Basic I was sent to Fort Bragg, North Carolina. In early Spring of 1965 President Johnson sent thousands of us to the Dominican Republic when their country was engaged in a civil war. I worked for the Singer Sewing Machine company after the Army in Marshalltown, Newton, Des Moines and was made Manager of the store in Ames, Iowa. It was while I worked in Des Moines that I met Elizabeth Stevenson, a Dental Assistant. We were married in the little Brown Church in 1967 in Nashua, Iowa after dating for several months. I was really lucky to have married her as she has been a wonderful wife. She now takes care of my 92 year old mother in our home. We have been blessed with eight children and twenty two grandchildren. I love playing with the grandchildren. In the summer our family goes to Adventureland park, followed with a pizza party. My wife Elizabeth loves doing Family history work and has completed many records of our family. If anyone has questions on family history or how to get started, call Liz. It was while at Fort Bragg that I was baptized into the Church of Jesus Christ of Latter-day Saints. Our family is very active in the church today. Liz and I love to go to the beautiful Temples that the church has built around the world. Stanley Heil posted a message on Guy A Buchwald's Profile. Happy Birthday Guy, I hope you had a great day. Patricia Gould Duff posted a message on Guy A Buchwald's Profile. Happy birthday Guy! Enjoy your special day! Guy A Buchwald has a birthday today. Happy birthday Guy! I hope you have a great day! Guy A Buchwald has a birthday today. New comment added. Guy A Buchwald updated his profile. View. Guy A Buchwald posted a message. Stanley Heil posted a message on Guy A Buchwald's Profile. New comment added. I'm glad you are coming to the reuion. It will be good to see you. I retired in Feb. 2014. I just love it! Guy A Buchwald changed his "Then" picture. New comment added. Guy A Buchwald added a photo to his profile gallery. New comment added. Looking forward to our class Reunion. 50 years already is hard to believe. Time goes way to fast. Guy A Buchwald added a photo to his profile gallery. Summer 2008 after 2008 RAGBRAI and at Adventureland with our children and grand children. Nicholas Kerby (grandson from Michigan) on train with me. Tom Kurth, Marshalltown; Todd Buchwald, Farmington, MN; Guy Buchwald, Ames, IA; Patrick Buchwald, Clearwater, MN; Picture taken at the Field of Dreams movie set. This picture taken after completing 7 days of RAGBRAI July 25, 2009 with the Iowa Valley Bicycle Club of Marshalltown, Iowa. Picture taken at the Marshalltown Community College. Elizabeth picking cherries in our back yard. This is another picture atop the High Trestle Bridge. It's part of the trail system that goes from Ankeny to Woodward. It's going be really lit up when its done and have large squares that go around it at different angles to give the effect of going into an Iowa coal mine. This is a picture of a Dust Devil that we saw in Red Oak, Iowa July 2009 while we were camped at a church on RAGBRAI. You can see the tent in the right corner and tent bags in the left corner. The fire dept. had to get it down with a ladder truck after it landed on a church steeple.